Strike or no strike, after a deal is ultimately reached on a contract for Los Angeles teachers, the school district will still be on a collision course with deficit spending because of pensions and other financial obligations. As fewer students enroll, public schools get less in per-pupil funding from the state, said Helen Cregger, an analyst and vice president at the financial services company Moody's. "Then comes the tradeoff between making good on pension promises and what you're capable of offering in salaries," she said. The downward trend in enrollment is due to skyrocketing housing costs that keep families with school-age kids out of the city and the growth of charters — privately operated public schools that compete for students and the funds they bring in. Los Angeles is among the school districts across California that are not well-positioned to manage the coming confluence of slower revenue growth, declining enrollment and rising pension contribution rates, according to a Moody's study published in September 2018. The LA district's contributions to the state's two large pension plans — California State Teachers' Retirement System and the California Public Employees' Retirement System — amounted to about 5.5 percent of the budget in the 2014-15 school year. By last year, that number had climbed to nearly 8 percent, according to an Associated Press analysis. The contributions ramped up quickly to chip away at plan underfunding and because of demographic trends: As retirees live longer, their lifetime pensions cost more. Meanwhile, the district is spending more on special education programs and seeing climbing health care costs. Governing bodies in some places — though not LA Unified — have skipped pension contributions altogether to deal with other more immediate budget crunches, compounding the shortfalls. California's major plans are short largely because they did not reach lofty investment return targets. David Crane, president of the advocacy group Govern for California, said there's nothing an individual school district can do about its rising pension costs. He said state aid — like a plan that new Gov. Gavin Newsom introduced Thursday in his budget proposal — could reduce the burden for districts, though. Newsom, a Democrat, wants to make a $3 billion one-time payment to California's teacher pension fund on behalf of schools to help districts that are seeing more of their budgets eaten up by pension obligations. Crane said districts can reach deals with teachers unions to eliminate or scale back paying for retiree health care. He said those costs are not needed because they're subsidizing care largely for people already eligible for subsidized coverage or Medicare. "It's coming out of current teachers' pockets," Crane said, and will only get more expensive in the future. Cutting the post-retirement benefits, which cost the district $343 million last school year, could mean raises of more than $10,000 for each of the district's 26,000 teachers, he said. LAUSD Superintendent Austin Beutner said he's "delighted" by the new governor's commitment to public education and added that it's the district's obligation to make good on current pensions. "The work's been done, the benefits have been earned," he said. "We wish the state would give us a little more money to cover the actual costs of those benefits but we're committed, of course, to maintaining the pension system that's in place." Many educators say they chose teaching over more lucrative professions because of the promise of a secure retirement, and they hammer at the moral argument that pensions are promises. Walkouts by teachers last year in Kentucky schools were largely over the governor's plan to cut future pension benefits there. Former New Jersey Gov. Chris Christie and his state's largest union spent nearly his entire eight years in office battling over pensions. Teachers are preparing to strike in Los Angeles on Jan. 14, where the union is pushing for higher salaries and more hiring despite warnings from the LA County Office of Education about potential deficit spending. Since 2014, California schools have been required to contribute an increasing amount of money to secure the pensions of current teachers and to pay down unfunded liabilities for retirees. In 2013, schools put in 8.25 percent of a teacher's earnings to help fund pensions. That rate will more than double to 19 percent by 2020. 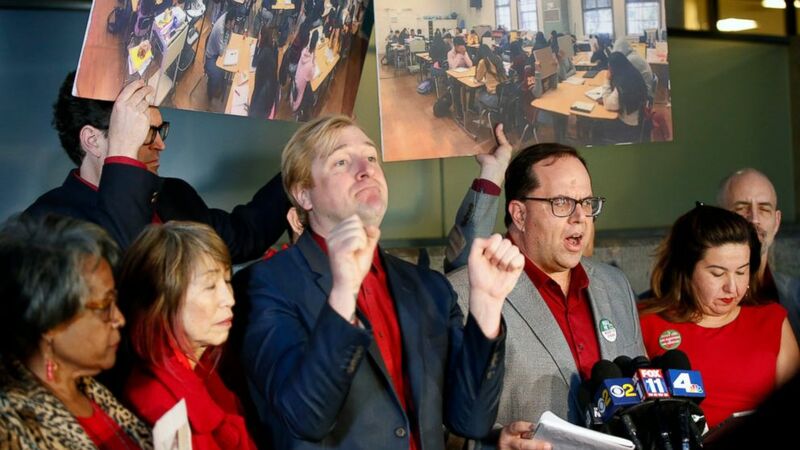 United Teachers Los Angeles has made Beutner, an investment banker and former Los Angeles deputy mayor without experience in education, a lightning rod in negotiations. The union says Beutner and school board members who voted him in are trying to privatize the district, encouraging school closures and flipping public schools into charters. Beutner's supporters say now more than ever the system needs someone with a business background and an understanding of budgets and the bottom line. Associated Press reporter Geoff Mulvihill contributed from Cherry Hill, New Jersey.